Katarzyna Marak, Ph. D., lectures at Department of English and Department of Cultural Studies at Nicolaus Copernicus University in Torun, Poland; the author of Japanese and American Horror: A Comparative Study of Film, Fiction, Graphic Novels and Video Games (McFarland 2015). 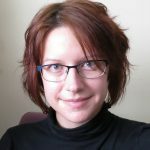 Research interests: popular culture, horror fiction—including the appropriation of the horror genre to digital media—Internet studies and game studies. To some, the VR technology seems like not only a tremendous development, but—more importantly—the natural next step in game design. However, flat, non-interactive screens have been the default display device for digital games for a very long time and the newly emerging VR environment involves problems with immersion/incorporation. The first important issue concerns its emersive qualities. The other issue is the problem of the expected and perceived quality of the games and the resulting situation where non-VR games are still expected to uphold the highest achieveable standards while the VR titles are not.